It’s hard work having a harem…. 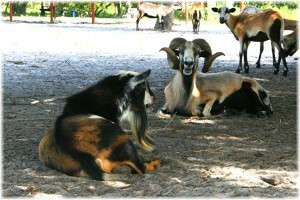 We have Nigerian Dwarf goats and Barbados black belly sheep. After trying our numerous varieties for our Petting Zoo, we settled on these two breeds. Barbados Black Belly sheep are perfect for warm climates like ours here in Florida, because they have no wool. We do have to shear some of our animals sometimes, but I personally don’t enjoy that chore. Nigerian dwarf goats are small and colorful and friendly, and we really enjoy this breed! The sheep and the goats have their own separate pens, but they also have a common area where they can mingle with the other small animals and eat hay. Our Billy and our Ram seem to enjoy each other’s company, and we often see them hanging out in the shade together, away from their girls. This entry was posted in Uncategorized and tagged Barbados Ram, Barbados Sheep, Black Belly Sheep, Blue Eyed Goat, Bradenton Horseback Riding, Buck, Buckling, Central Florida, Florida Barn, Horse Rental, horseback riding outfit Bradenton, Nigerian Dwarf Goat, Paint Goat, Petting Zoo, Registered Dairy Goat, Tri Color Goat. Goin’ on an Adventure Ride….